Practice the questions given in the worksheet on multiplication table of 21. 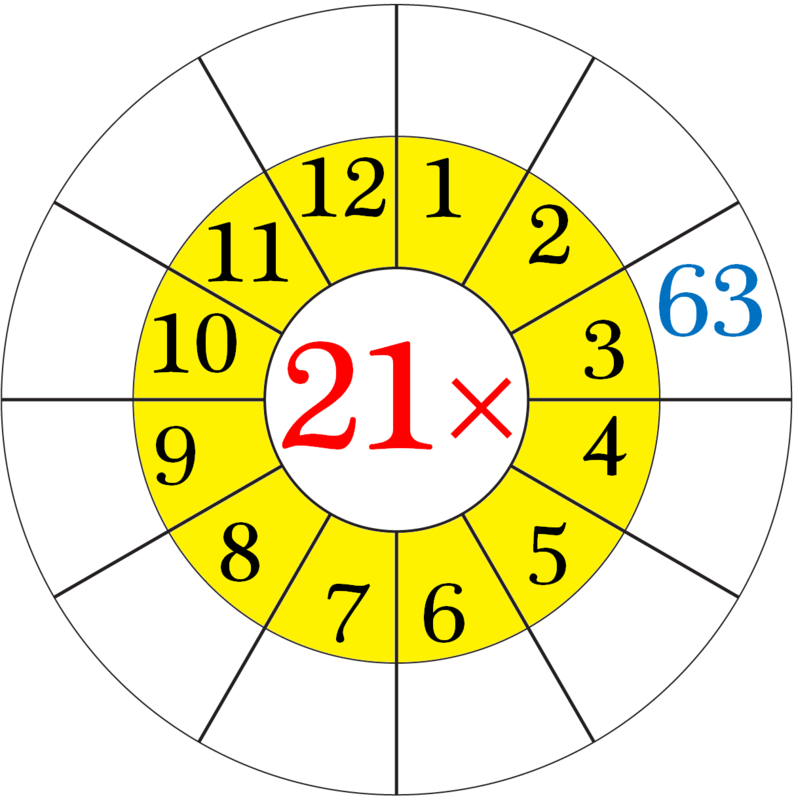 The questions are based on finding the product using the multiplication table of 21. 1. Count forward by 21’s from 21 to 420. 2. Count backwards by 21’s from 420 to 21. 4. Find each product using above multiplication table of 21. 5. Rachel has 21 bottles weighing 8 gm each. What is the total weight of the bottles? 6. Emily’s income is $ 9 per hour. How much does she earn in 21 hours? 9. (i) What are 21 fives? (v) What are 3 times 21? (ix) What is 21 multiplied by 9? (x) 6 multiplied by 21? 10. What does 21 × 10 mean? What number is it equal to? 11. A tyre factory produces 21 tyres a day. How many tyres will the factory produce in a week? 12. The weight of one bag of wheat is 6 kg. What is the total weight of 21 such wheat bags? 13. (i) How many twenty-one’s in 105? (ii) How many twenty-one’s in 210? (iii) How many twenty-one’s in 168? Answers for the worksheet on multiplication table of 21 are given below to check the answers of the above multiplications. 1. 21, 42, 63, 84, 105, 126, 147, 168, 189, 210, 231, 252, 273, 294, 315, 336, 357, 378, 399, 420. 2. 420, 399, 378, 357, 336, 315, 294, 273, 252, 231, 210, 189, 168, 147, 126, 105, 84, 63, 42, 21. 10. 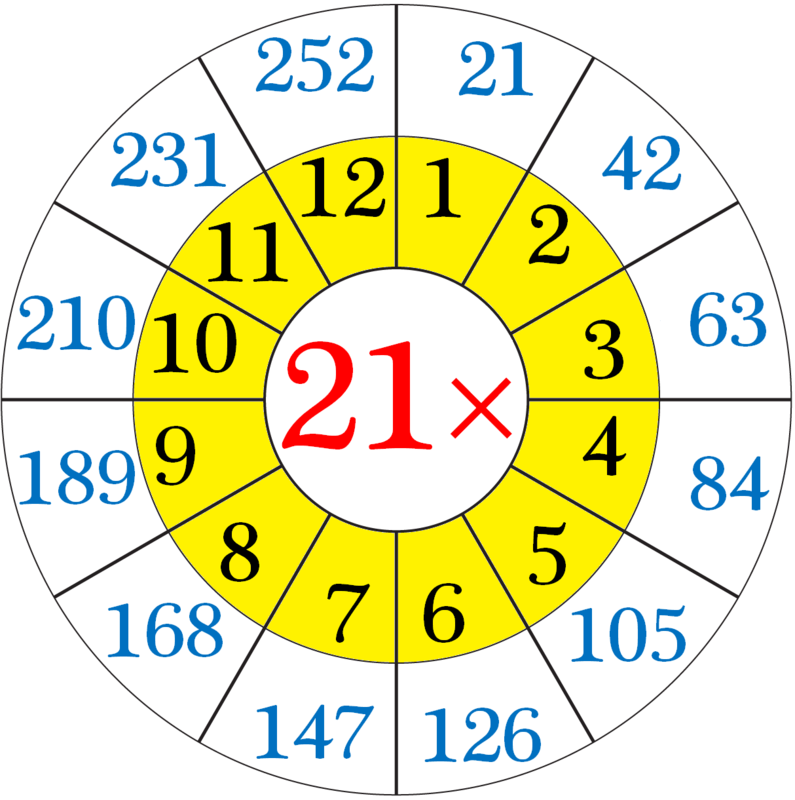 21 × 10 means that the 21 and the 10 are multiplied together or ‘twenty-one tens’ or ‘twenty-one times ten’.